I confess, I never liked cooking, and it never occurred to me to cook. It is something that other people do, like my grandmother. And my grammy Gladys was a great cook. Her ricotta gnocchi are my Proustian madeleine. I make things to go on the body, not in the body. But in 2011, which was my 40th year and also coincided with Chez Panisse’s 40th birthday, I apprenticed in the cafe with Cal Peternell as my mentor. 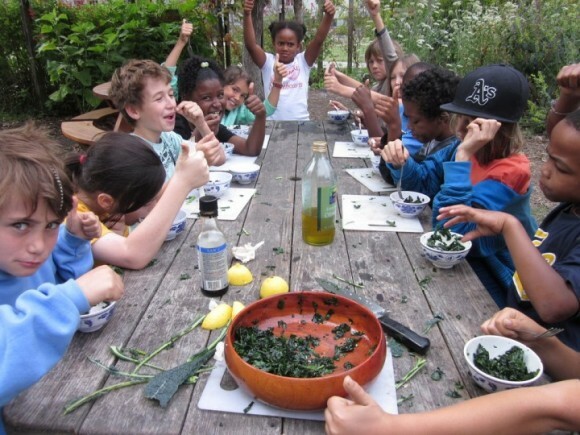 I spent a few months there on Thursdays learning what to do with artichokes, asparagus and beets, how to make my first aioli, a Julia Childs-inspired soup celestine, how to clean 40 pounds of squid, how to taste and most importantly how to do it all with grace. 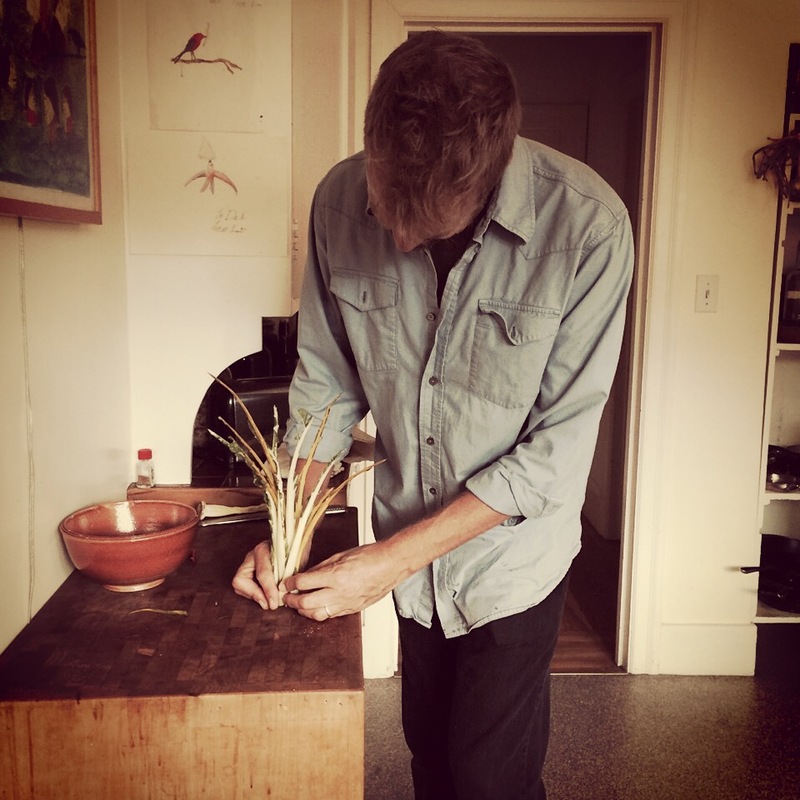 The ritual of prep cooking was like the ritual of cutting and manipulating fabric; and the improvisation that seemed in many ways to happen daily in the Chez Panisse kitchen was similar to what I did in my studio. I got it. I made a bunch of gowns inspired by it; and began hosting salon dinners in my atelier soon after. So I do in fact cook, and I cook often, but for me people are my true ingredients and making food over the past couple of years is in fact more of a performative act and an audience is necessary. So I admit I still rarely cook for my family. But when Cal’s cookbook was sent to me a few weeks ago, I read it through that very evening, and picked a recipe to try every night for dinner. 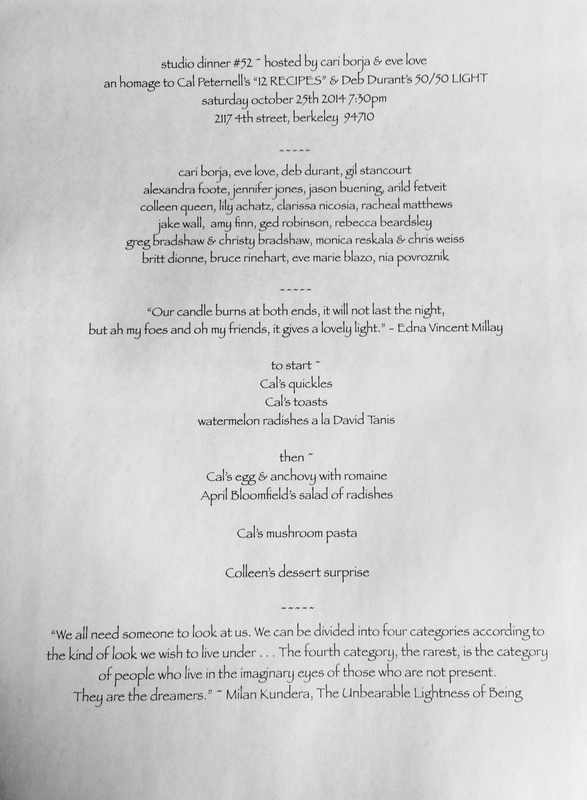 And for my 52nd salon dinner—which happened last week—my friend Eve Love (who I met interning at Chez) and I did an homage to Cal, making quickles, toasts, a green goddess salad and a chanterelle pasta, all inspired by Twelve Recipes . 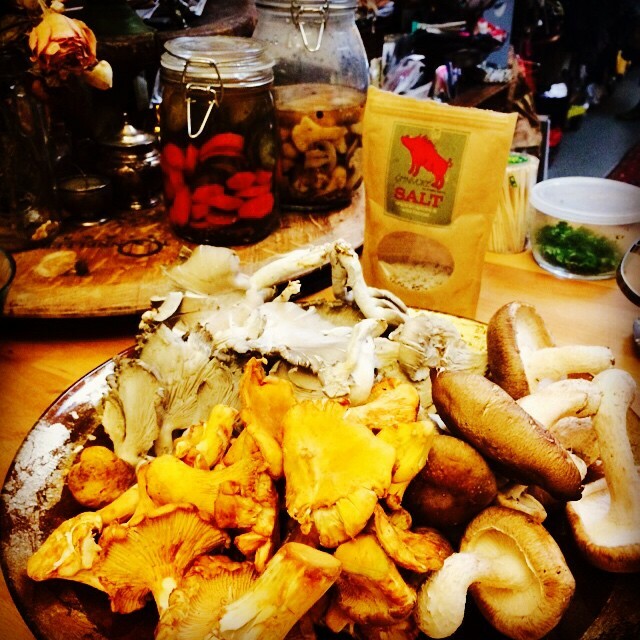 Salon dinner still life: Cal’s quickles with chanterelles, shiitake and oyster mushrooms for his mushroom pasta, along with Angelo Garro’s Omnivore Salt. To me what is revolutionary about a cookbook is its voice, and its ability to bring you into it and make you feel at home, comforted yet inspired. Since starting the salon dinners in 2012 I have bought close to 100 cookbooks, have read some, used recipes from many, but analyzed them all. Yes, I’m an anthropologist at my core and want to understand the relation between chef/writer, voice/context and consumer/home cook—but I have also been developing my own voice in cooking, curating and putting together experiences around food. So I look to books like Daniel Patterson’s COI , David Kinch’s Manresa and Mourad Lahlou’s New Moroccan for how they each translate their own personal narrative, history and locale into a menu that gives a clear sense of place, person and vision. For recipes for my dinners I turn to David Tanis’s three cookbooks, At Elizabeth David’s Table , Joyce Goldstein’s Italian Slow and Savory , Shelley Lindgren’s A16 and SPQR , Suzanne Goin’s AOC and most recently April Bloomfield’s A Girl and Her Pig for simple-ish family style yumminess that I can easily serve to 22 or so guests … I love repetition, and continually improvise and add to and subtract from these favorites. 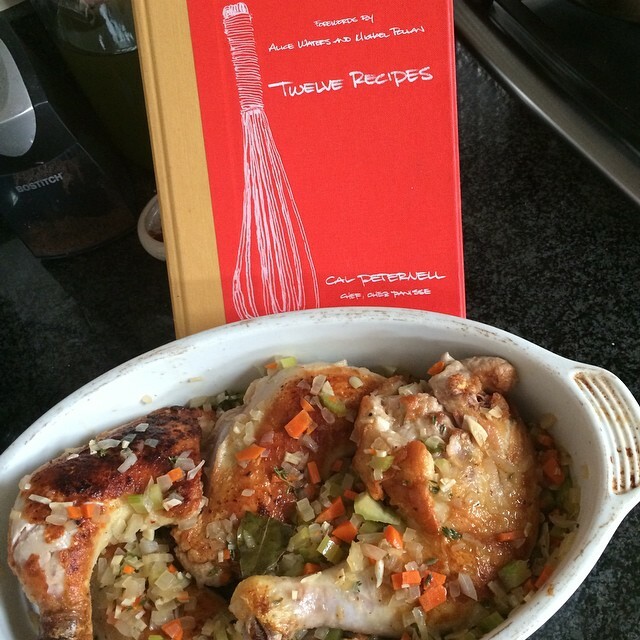 Braised Chicken from Twelve Recipes—first of three times made, with different chicken parts. But Cal’s book is different. It has made me excited to cook at home and with my kids. And the kid element is integrated into the idea behind the book itself—it was when his son Henderson was about to leave for college that he came up with the initial concept of making a cooking handbook for his son to take with him. For me, it’s a combination of Cal’s inviting voice and the book’s convenient structure—its 13 chapters, with each one based on a particular “building block” like “eggs,” “toast,” “beans,” and “braising”—as well as the layout of recipes which beautifully conveys a possibility of creative improvisation. Of course it may also be my relationship to Cal as my first mentor and our similar at times laid-back “ways of doing,” but it speaks clearly to me and my way of thinking and creating. Below are excerpts from a conversation we had last week, after cooking and eating a few things from his book. 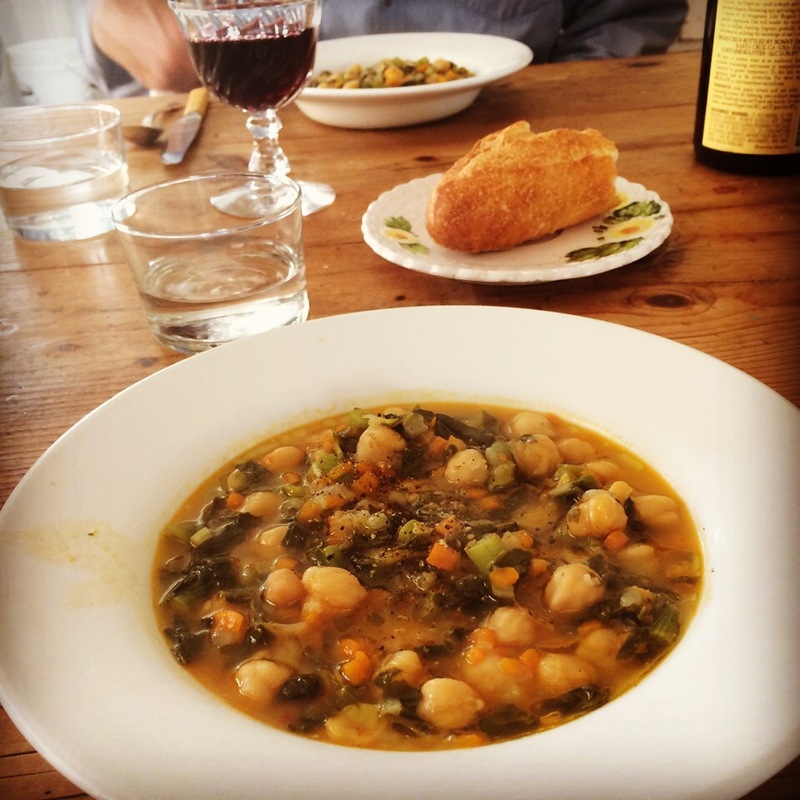 We started with a classic green goddess salad (page 91), minestrone soup (ribollita recipe minus the bread, page 65), a bit of mid-day Syrah to go with it, and then talked about some of Cal’s favorite things, his ways of doing, and his journey to now. 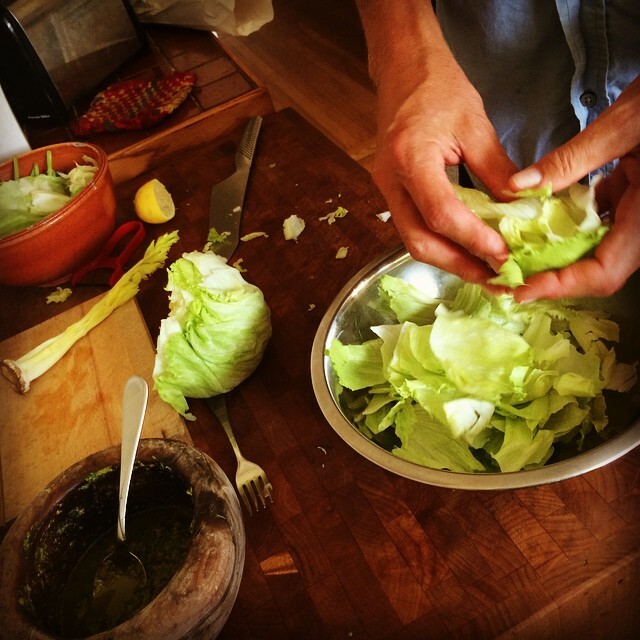 Iceberg lettuce for the goddess salad. 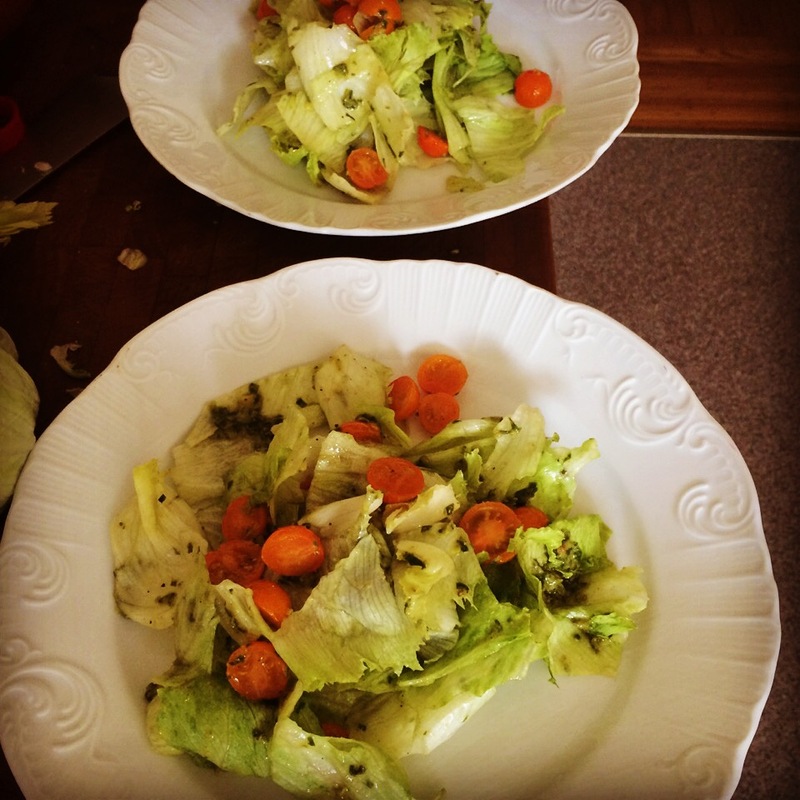 Goddess salad, ready to eat. Cal, figuring out what to do with the Swiss chard stems. “As a young child, I remember loving The Biggest Bear . The story is sweet and a little disturbing and there are wonderful drawings, some of hams and maple syrup and ruined pantries. Later I got into Carlos Castaneda, Robert Ludlum’s full-speed story-telling in the Bourne series, Herman Hesse’s Narcissus and Goldmund and Siddhartha , Salinger, Hemingway’s The Nick Adams Stories … For cookbooks, the number one for just fun, and funny, reading is Fergus Henderson. Fergus loves offal more than me, but the writing is just so true and compact. Richard Olney’s books are similarly amusing—I like his slightly snotty tone—and the recipes and sensibility are great. The cookbooks that have informed my cooking most are probably those by Paula Wolfert, Elizabeth David and Marcella Hazan. For film, Vittorio de Sica’s Miracle in Milan ; and Umberto D. was amazing and sad and beautiful. The Night of the Iguana was an incredible movie and turned me on to all of Tennessee Williams’ plays … the literature that has most consistently been made into great films: A Streetcar Named Desire , The Rose Tattoo (Anna Magnani and Burt Lancaster! ), The Fugitive Kind (Anna Magnani and Brando!) Every one of them. Harold and Maude—I remember the first time I watched it, when it was over, I sat there, stunned, then rewound the VCR and immediately watched it again. It was the first time watching a subversive film and thinking, ‘Oh, WOW’.” Also, recently I saw this little Werner Herzog clip at the Mad Animals event at Creative Growth. It was about these penguins in Antarctica (filmed by his friend who films under ice—very eerie). One penguin heads inland and there’s a thousand miles of ice in front of him. The others are going off to fish or sit their eggs or something, but this guy, he’s crazy, suicidal. The narrator claims that even if they caught him and turned him back, he’d just do it again. I don’t think of myself as particularly single-minded, but I admire it in others. And now nothing will. Thank you, Cal! Drawings by Kathleen Henderson on the tables at the Chez Panisse book signing. Henderson did the drawings in Twelve Recipes , along with Peternell’s sons Liam, Milo and Henderson. 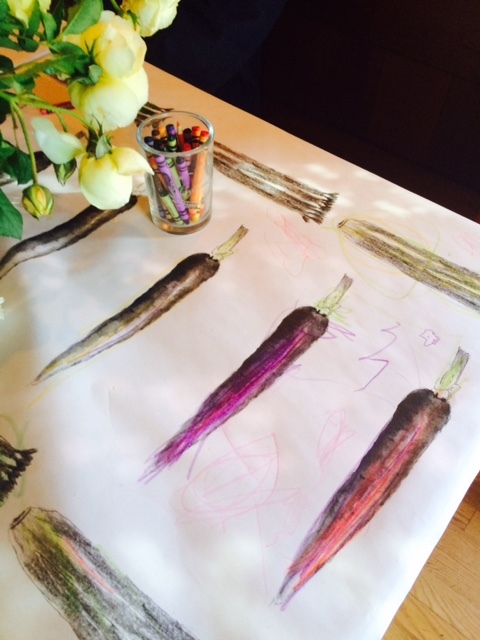 “Carrots in Silk” from Cari Borja’s Chez Panisse Collection. Credit: Gabriel Harber. Cal Peternell will read from and sign Twelve Recipes at Bookshop Santa Cruz at 7 pm on Thursday, November 20. He’ll give a reading and talk at Kendall-Jackson Winery in Fulton from 6-9 pm on Monday, November 24. On Sunday, December 7 from 12:30-3 pm, he’ll appear at a book signing and Twelve Recipes-inspired lunch prepared by Chef de Cuisine Fabrice Marcon at the Left Bank in Larkspur. 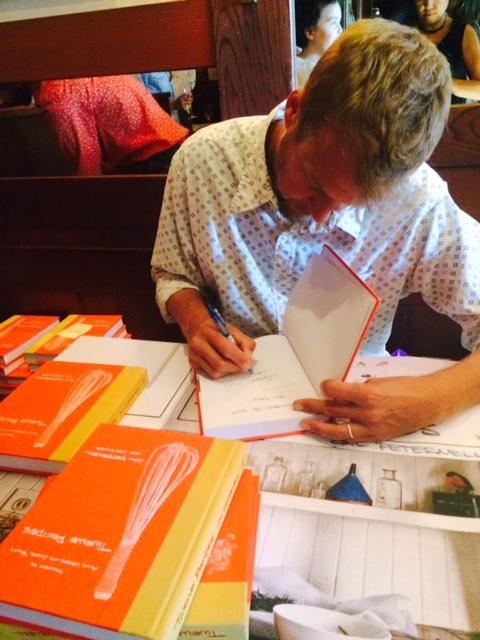 On Thursday, December 18 at 7 pm he’ll read from and sign copies of Twelve Recipes at Rakestraw Books in Danville. On Sunday, December 21 from 6-10 pm his sons and Russ Moore will cook at Camino Restaurant in Oakland. Click here for info on more events. 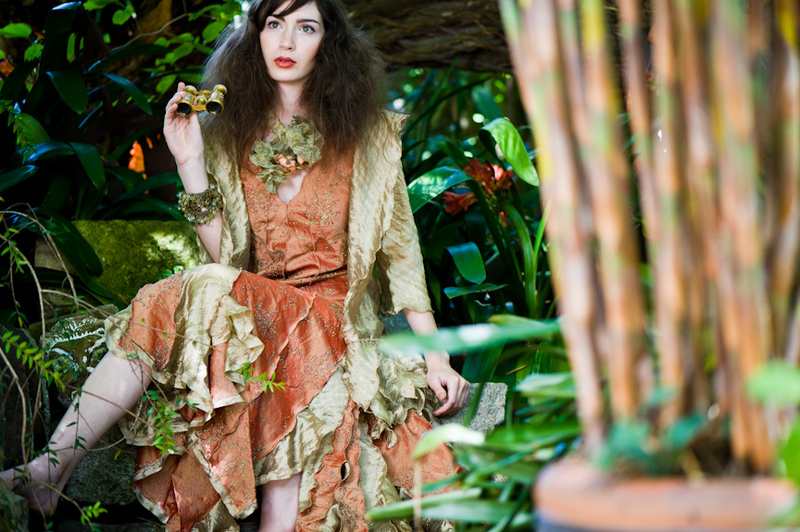 Cari Borja began her career as a clothing designer while earning her PhD in anthropology and film at UC Berkeley in 2001. Since then she has created collections inspired by film and food and has become known for her salon dinners in her Berkeley atelier where she weaves together people from different disciplines and professions. 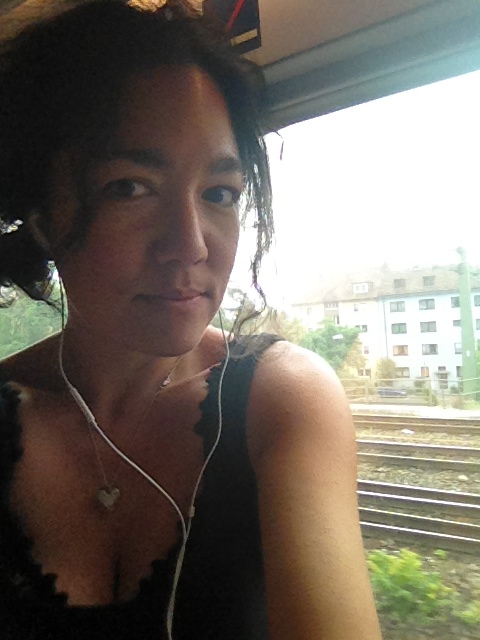 Cari is currently writing a book about the dinners with interviews with guests featured on her blog, and also consults with start-ups and other companies curating dinners and connecting people. Read more about Cal Peternell, as well as other chefs, winemakers and guests at Cari’s dinners on Cari’s FashionFilmFood blog. 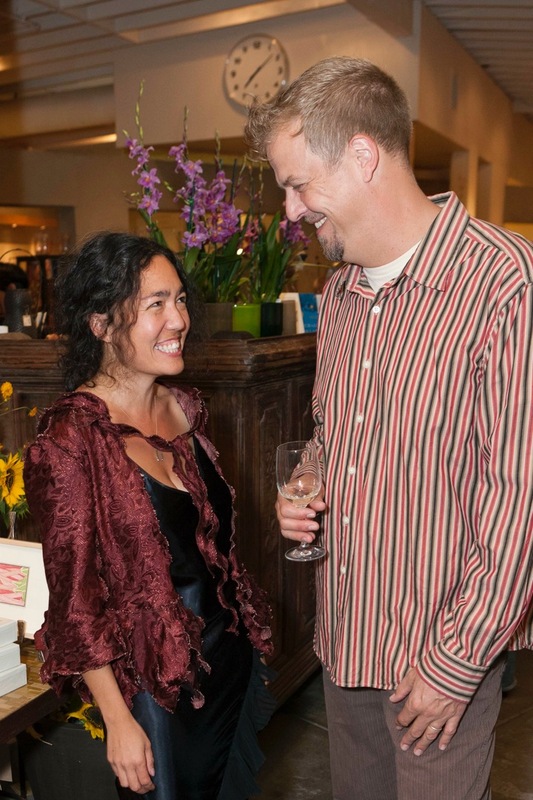 Click here to read about Cari’s salon dinners in Berkeley. 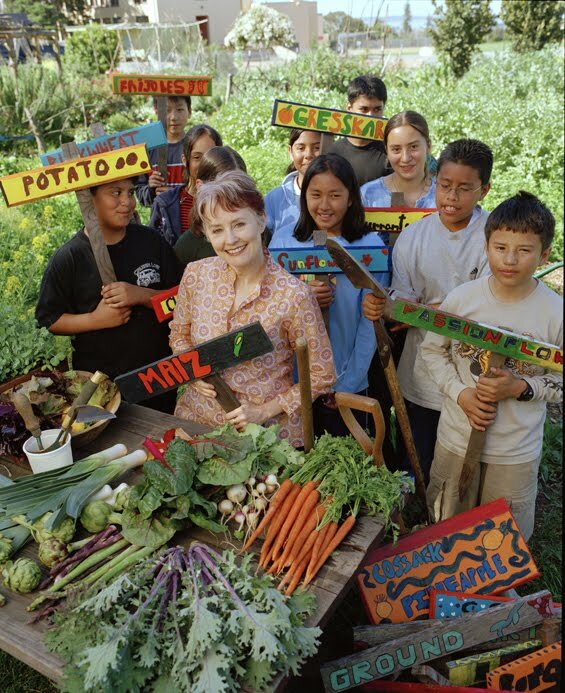 This entry was posted in Eat and tagged Cal Peternell, Chez Panisse, cooking, food, salon dinners. Bookmark the permalink.